Of course, issues like erosion control and drainage pop up when talking about slope management, and are important slope stability considerations. So before we cover what to do with your steep backyard slope, let’s discuss what’s happening on your slope first. What Kind of Slope Do You Have? Where does water drain on your slope? Is it moving across it or down it? Look for water channel clues. Are the channels wide or narrow? What direction are they headed? If the answer is down, erosion control will be a problem and you slope may be more unstable than you want. This is something to keep in mind when you landscape – slope stability. Dig a hole and fill it with water. Note how long it takes for the water to drain. If drainage occurs within an hour or so, that’s good. If it takes several days to drain, that’s not so good. You don’t want water sitting on your slope because wet soil and mud on a steep hill can cause erosion and slide issues. Dig another hole somewhere on your slope, preferably where you’re considering landscaping. If you find solid rock or clay, the soil on top can slide down your bank easier and this will inform what you plant to better “secure” the bank. Meanwhile, analyze for soil with a home test it. Make mote of what you find because it will inform what types of plants will grow best there (or not grow at all). Is your slope accessible? Are you able to walk up your slope or do you need to hold onto something at all times? Your answers will help you decide if you can plant and maintain your slope or bring some of it into your existing backyard landscape. Is your slope in full sun? Again, noting this factor will help you choose how you landscape your slope. What To Do With Your Slope? Because erosion is an issue in many cases, hillside stability is key. 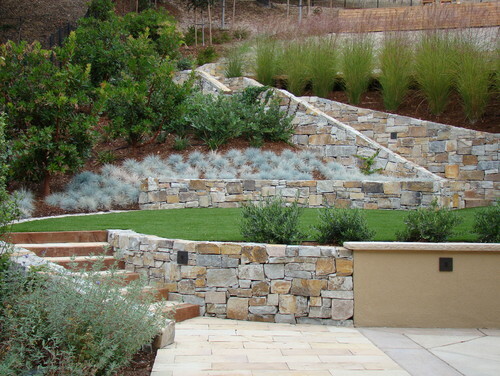 What you plant can address erosion and most hillside movement in your landscape, as can reinforced retaining walls (something has to keep all that dirt and rock up there). South Deerfield Architects & Designers Habitat Post & Beam, Inc. Most hillsides can be made relatively stable with plants . The planting should be a mix of groundcover, shrubs, trees, and perennials with the areas between plants covered with mulch or boulders. A mix of plants and vegetation layers ensure that when it rains, the force of the water hitting the ground is deflected. In most cases, if your slope soil is deeper, a mix of deep-rooted plants like bougainvillea and shallow-rooted plants like monkey flowers or sagebrush are needed to secure the top soil to the bottom rock. If you have surface soil on solid rock, planting trees helps keep water moving off the slope. For actual planting, create small divets in the sloping soil as individual planting holes. Stagger planting placement to help to prevent water from running straight down the hill. Dig holes that are large enough to allow the roots to spread out and apply a layer of organic mulch between the plants, such as large bark chips. Be sure to irrigate your planted slope, using drip irrigation or soaker hoses, which allow water to soak into the soil and reduce runoff. Depending on the size of your slope, you can divide hillsides into more manageable sections with retaining walls, which are strong and stable barrier walls usually made of stone, concrete or lumber. These walls can be placed where they will hold back the soil above, and make a space below that can be left as a slope, leveled, or planted. Multiple walls can be placed at different points to create a terraced look. Terraces can range from a few feet wide and used as planting areas to wide expanses. If your is large, some experts recommend putting an 8-10-foot terrace every fifty feet to make your slope much more functional long term. Creating tiers down your slope make it less likely to erode. By digging into the hill at certain points, you can also create tiers for planting. Retain the walls of the tiers with stone pavers and layer different plants and landscaping elements to create contrast between tiers. If you use rock walls as tiers, try filling them in with plants, small trees, or even river rock for a natural look. 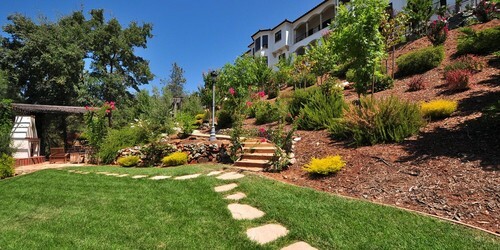 If your slope isn’t dangerously steep, enhance its incline with paths or staircases made of stone. If you do have a very steep bank, consider a winding path made of pavers, or bricks that traverses your slope to create less of an incline. 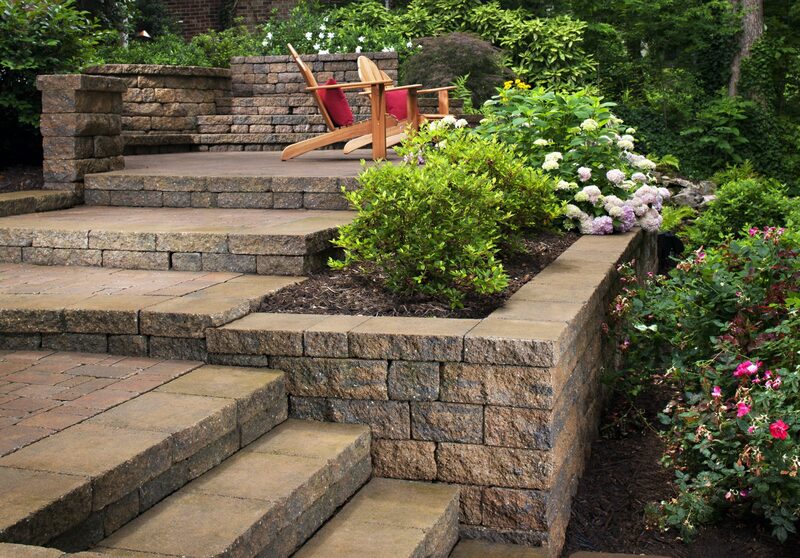 Stepping-stone paths are pretty, too, and add form and function to your backyard. 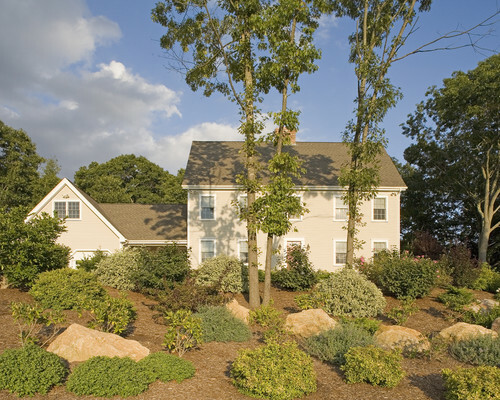 Using rocks for landscaping adds some “nature charm,” while also holding plants and soil in place. Make indentations where rocks can sit without rolling and place different-sized rocks of varying texture and color together in groups. To avoid an all-rock look, leave spaces between groupings and spaces between some of the spaces to add medium-height plants or flowers to break up the landscape. As you might imagine, native plants are native for a reason. In fact, studies show that using native plants on a slope causes no measurable erosion because they’re adapted to the California environment. 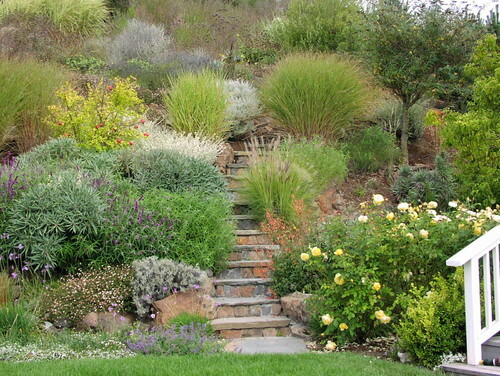 Native plants are perfect for sloping hillsides because they’re pretty, stabilize slopes and reduce water usage. You can also choose native plants with different bloom cycles for year-round color and variation. If you’re into birds, and butterflies, using native plants will attract them to your bank. If you do go native, some good choices include California holly, California Glory or Dara’s Gold. Native ground cover options are California perfume, bear berry, and coyote bush. Planting grass does not stop erosion, and it’s been found that 30-75% of all rainfall on grass- covered slopes runs off. Also, seeding a bank with grass creates a weedy slope that is hard to stabilize and makes reestablishing plants much more difficult. So-called plastic weed barriers or erosion matting will sooner rather than later curl and kill almost everything under it, except possibly weeds. Plus, plastic in a natural landscape does your backyard no beauty favors. Fabric mats don’t last, cause greater erosion, and attract rodents. That’s enough about straw mats. Ice plants have very shallow roots and are heavy, which add to the weight of the slope, actually encouraging the soil they’re superficially planted in to slide after a rainfall. Ice plant is used so often in southern California because it doesn’t burn very well, and addresses fire concerns. If fire danger worries you, instead of ice plant, use California native plants, which tend to be more fire-retardant than other varieties, and use mulch, which helps keep plants hydrated and a little less flammable. Backyard slopes can be made into things of beauty, but before landscaping, it’s always a good idea to check with a landscape architect to ensure you’re not creating potential erosion problems. Overall, if you’re still stumped, go with a mixture of deep-rooted California native shrubs, and trees, mixed with shallow-rooted shrubs that are mulched. Do you have a slope in your backyard? What did you do with it?